£92 flat-bed business class deal on LAN’s Madrid to Frankfurt service (and earn tier points)! Last year I wrote an introductory piece on South American airline LAN. LAN is a oneworld partner so you can use Avios points to redeem for its flight from Madrid to Santiago, Chile. 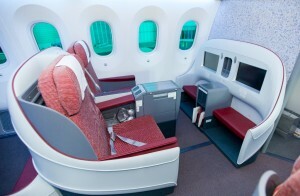 It also has an impressive business class service as you can see from that article and the photo below. Few people know that the LAN flight from Chile does not terminate in Madrid. It carries on to Frankfurt. Last Summer LAN was offering some exceptionally good deals on this flight. At present, the prices are not quite as good but – if you are a bit of an aviation geek or simply fancy earning some British Airways tier points in style – this could be an option. Why? Because you can buy tickets just for the Frankfurt to Madrid flight. The LAN website is here. You will earn roughly 1,100 Avios points and 40 tier points for each segment. The flight is 2 hours and 40 minutes so you will get a decent amount of time to enjoy the LAN seat. Lounge access is also included. 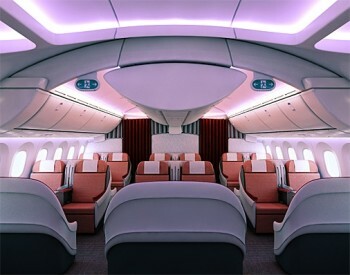 Note that you will be flying a Boeing 787 Dreamliner which a lot of people have not yet been able to experience. You can book this on the LAN website as well as, with a small booking fee, expedia.co.uk which is where I got the prices above. The timings are not ideal, to be honest. The Frankfurt flight departs at 19.35 and lands in Madrid at 22.10. The Madrid to Frankfurt flight leaves at 15.10 and lands at 17.45. There probably aren’t many HFP readers who actually need to fly from Madrid to Frankfurt, or vice versa. However, if you are after some cheap BA tier points and fancy trying out a different airline then this is a fun deal. If you want to do a triangular trip from the UK to Frankfurt to Madrid to the UK or vice versa, remember that some Iberia flights to Heathrow are operated with long-haul A330 aircraft with flat beds in business class. You can redeem these seats using Avios and it would be an interesting comparison to do that flight and the LAN trip as part of the same journey. Does anyone have any experience of doing a back to back from Madrid and turning straight around in Frankfurt?